To go to next/previous photo, swipe left/right or click bullets underneath. Click/tap photo to enlarge. From a home in Wichita’s Lakepoint addition. 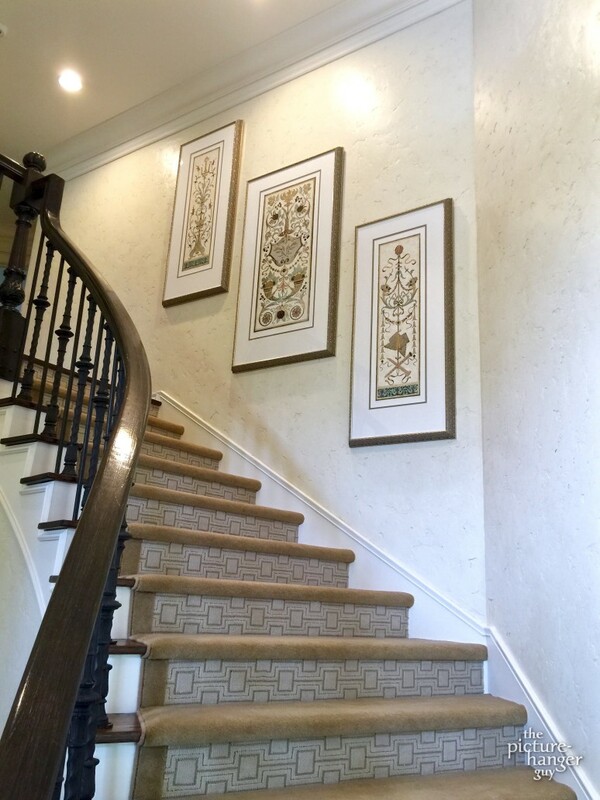 Main staircase from front foyer to the second floor, hung with three related pieces. 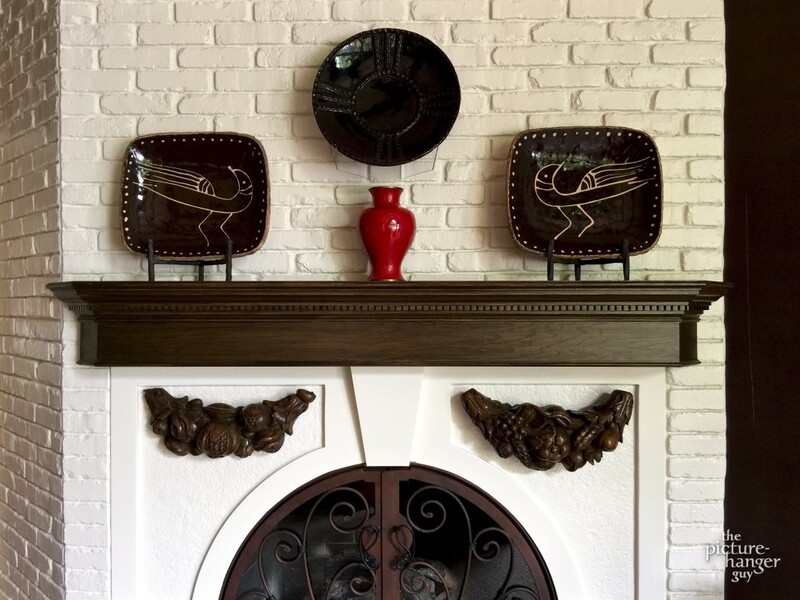 Items can be hung with the use of anchors sunk into masonry, such as the center plate and two crescent-shaped wooden sculptures in this fireplace area. Same Lakepoint home as previous photo (interior design by Olson-Blackburn Interiors). Picture groupings — this one at the offices of a law firm — are first laid out on the floor to test what options would work best in the available space. Once you’ve okayed the layout, we get started. The Hangman at work. 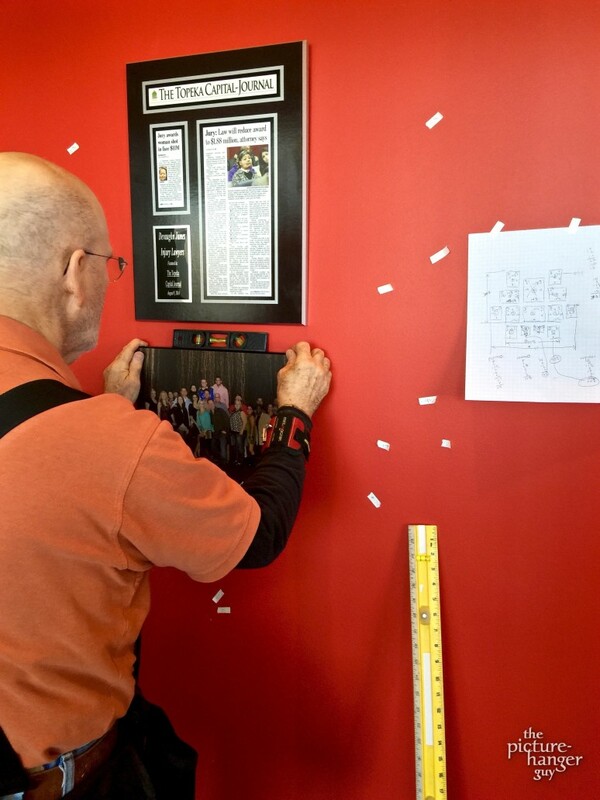 A layout sketch is taped to the wall for reference. Measurements are marked on removable artist’s tape — not on your walls. 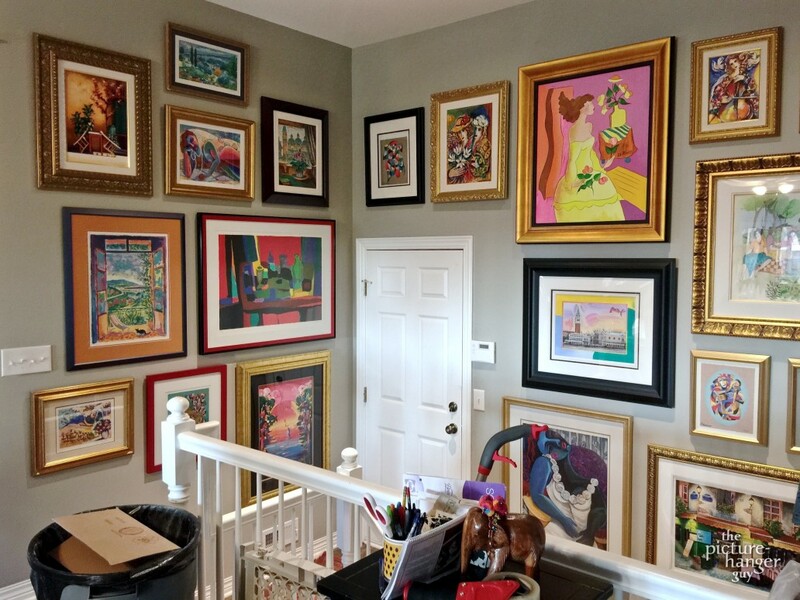 Pictures are hung with a level using two hangers on two hooks (no need for a wayward wire). So everything stays straight for good. 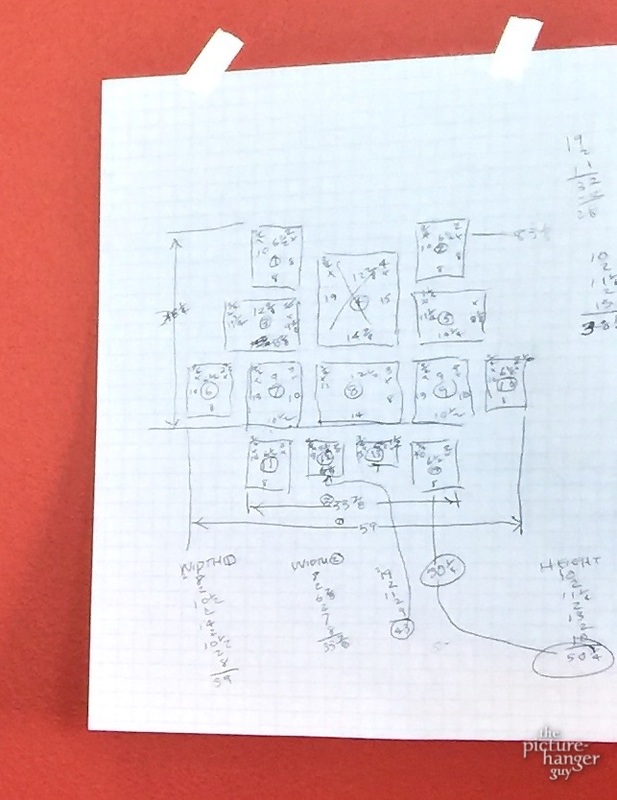 Close-up of the layout sketch in preceding photo (click to enlarge). Selecting paintings for another grouping, this one much larger. 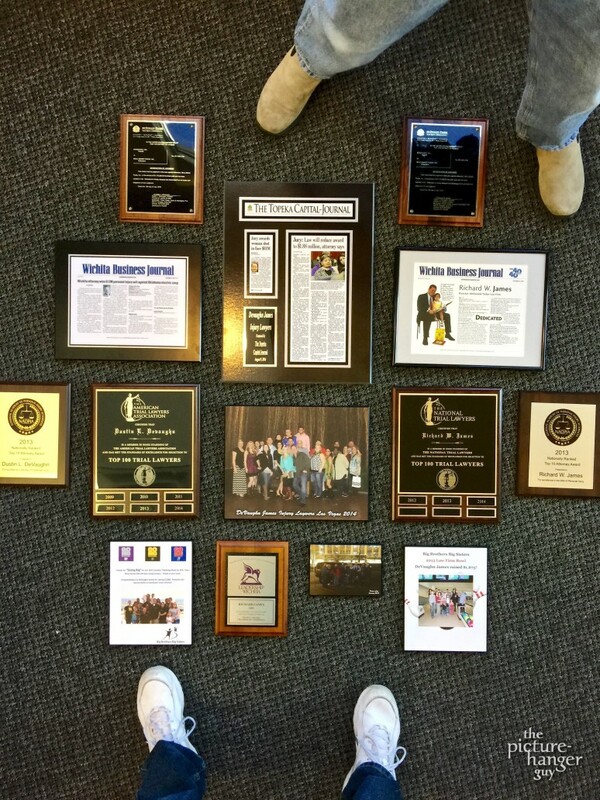 The grouping laid out on the floor. This is for one wall of three in a stairwell to be hung with paintings all around. The completed grouping on the first wall of the stairwell. The Hangman at work on the stairwell’s second wall. Walls one and two, complete. The stairwell’s third and final wall on the left. The layout was planned out to ensure room was allowed for the light switch as well. 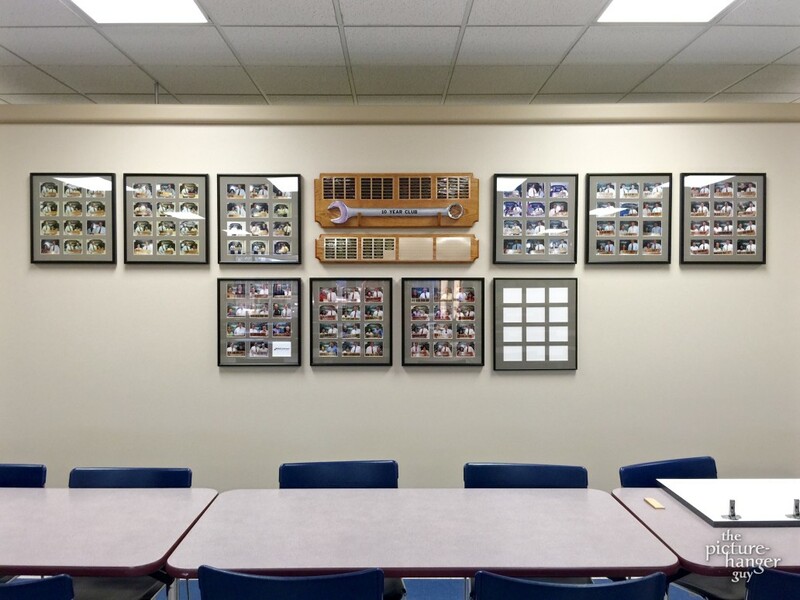 Employee anniversary-milestones wall in the lunch room at Mid-Continent Instruments. 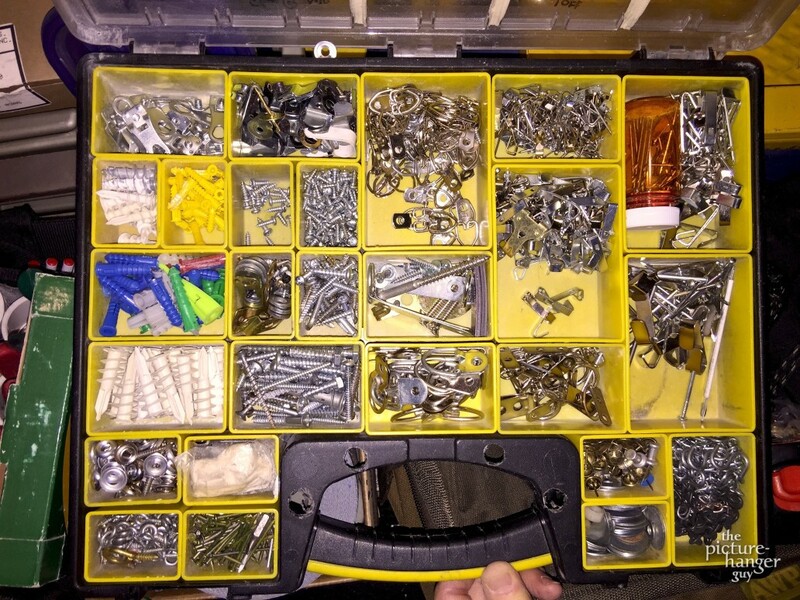 Ninety percent of items on a typical job can be hung with the hardware in this kit: from pictures and paintings to mirrors, clocks, sconces, metal sculptures, stone carvings, bulletin boards, shelves and shadowboxes, towel racks and toilet-paper holders, even deer heads. 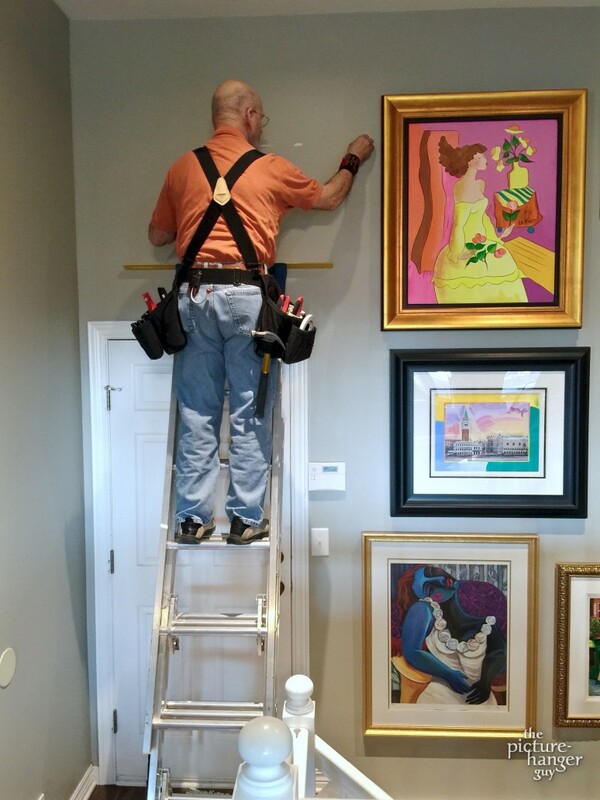 When the pictures, paintings, mirrors, and other items on your home or business’s walls need to be hung properly, look right, and stay straight for good — even deer heads and other hard-to-hang items — call on The Hangman and Picture-Hanger Guy team. We hang most items using two hangers on two hooks so that everything always stays level — with no use of the typical picture wire that eventually and inevitably leads to things getting knocked out of alignment. 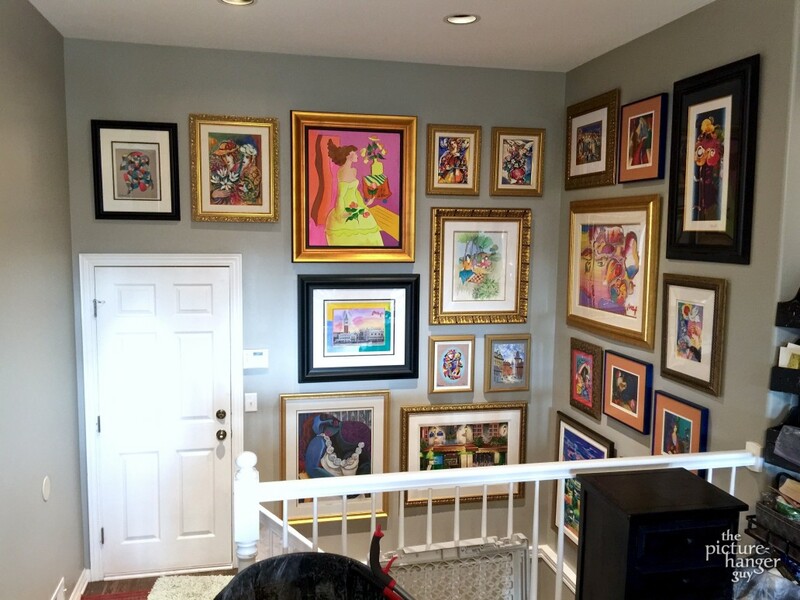 Instead, everything is mounted solidly on the wall with the same techniques professional art galleries and museums use, to stay straight for good. 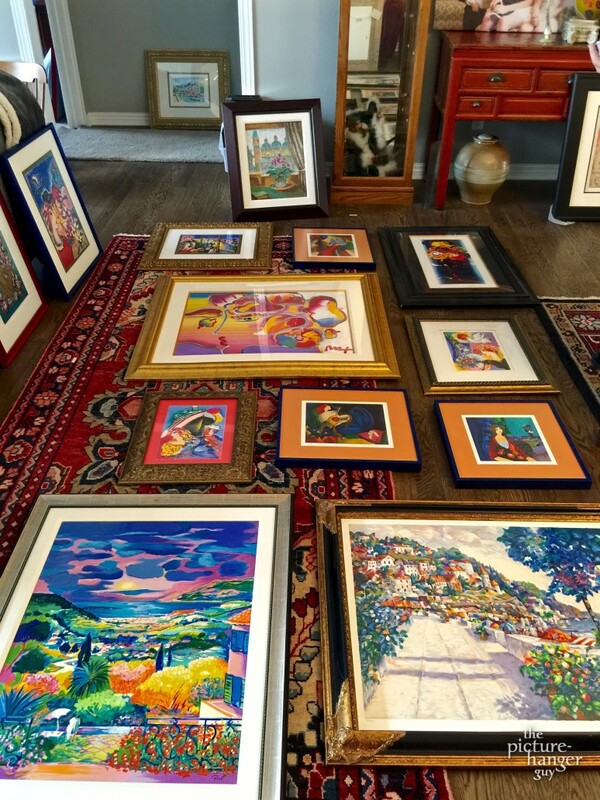 Creating artistic groupings is one of our specialties. 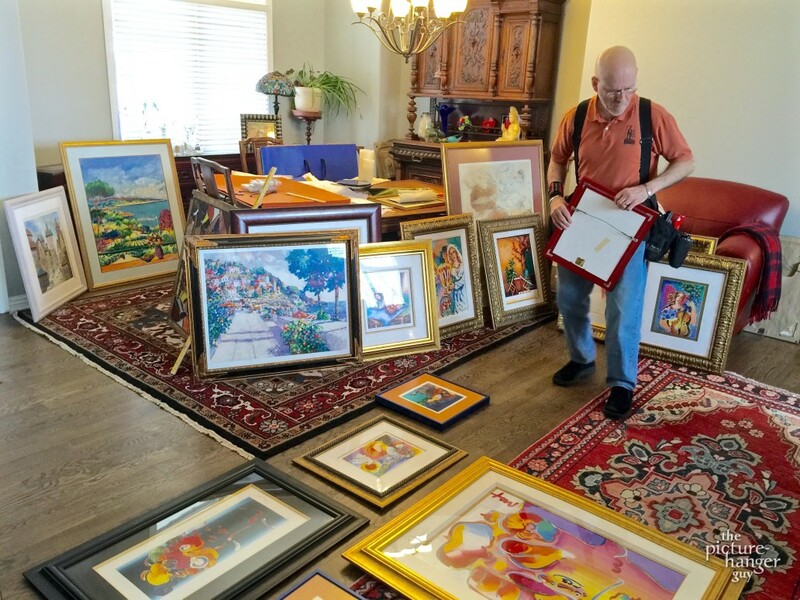 We’ll work together with your input to arrive at a pleasing and aesthetic arrangement to set off your pictures, paintings, and other items in the best light possible. You can count on the fact that once up, the entire grouping will remain perfectly in place as originally hung, for years, without the possibility of anything being knocked askew to detract from the effect. Background and experience. For those of you who haven’t been introduced, I’m Ward Nicholson (The Picture-Hanger Guy), and currently I work with George Charlsen (a.k.a. The Hangman) who’s been serving Wichita and surrounding areas now for over 30 years. George has a reputation as the go-to guy in the area when things need done just right, and has been overseeing my training in the trade using his methods (learned during his early years as director of the art museum at Emporia State University). The two of us met originally when working as graphic designers back in the 1980s. More recently we renewed our acquaintance after we began bumping into each other at the grocery store occasionally, and George took me on as his assistant. For the time being we’re enjoying the heck out of working together, and neither George nor I see him retiring soon. At whatever point he does, however, I’ll continue to carry on in the same tradition. 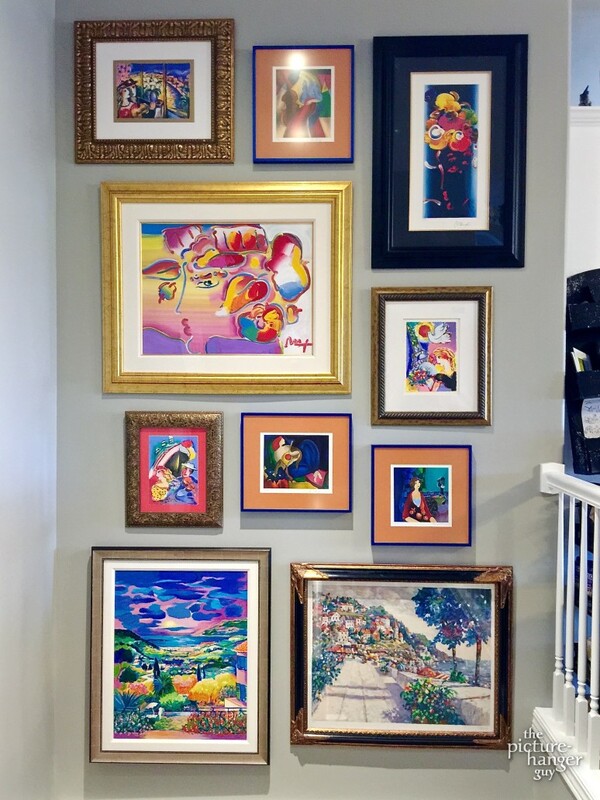 Almost anything to go on a wall is something we can hang for you — safely and securely, and with an eye for aesthetic placement as well. 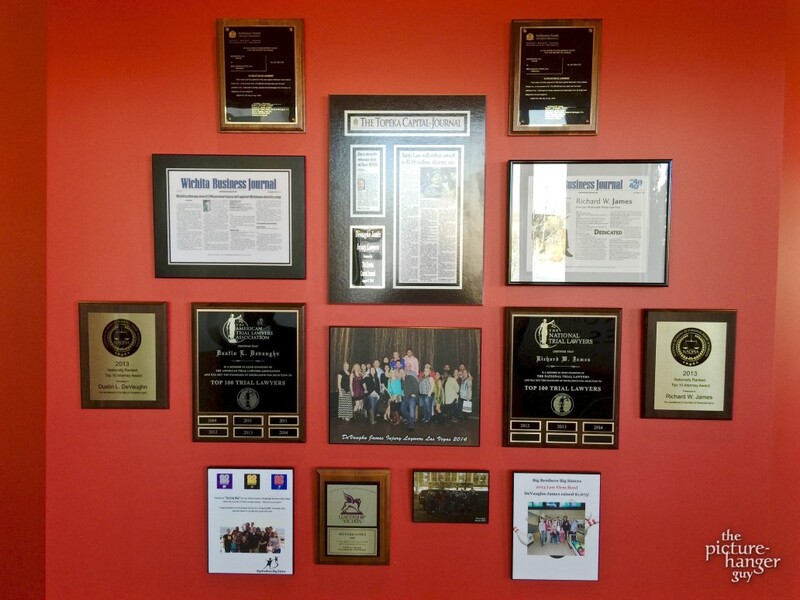 If you’re remodeling or making a big move to a new residence, for instance, or opening or expanding your place of business, we can handle almost everything you need to put up on the walls. All typical household or functional items such as mirrors, towel racks, toilet-paper holders, whiteboards and bulletin boards, shelves, shadowboxes, crosses, and clocks (the whole range up to and including very large clocks with heavy pendulums, cuckoo clocks, etc.). Even more unusual or valuable articles such as stone sculptures, vintage musical instruments (we’ve hung Aboriginal didgeridoos before), swords, Native American snowshoes, primitive wood carvings, and so forth. And if something is beyond our capabilities, don’t worry, we’ll let you know, along with good suggestions for the best way to get the job done. George Charlsen, the Hangman, schedules all of our jobs, and this web page serves as his online home as well as mine. To get in touch, just contact me, Ward Nicholson, and I’ll pass the word on. Then George will call to discuss your needs and arrange a time for us to come by and get your items hung — just the way you want them.